LANCASTER – Starting Thursday, Nov. 3rd, just before daylight savings time, the BLVD Farmers’ Market will switch to its winter hours – 2 p.m. to 7 p.m. The Farmers’ Market will continue to be held year-round, including the Thursdays before Christmas and New Years. For Thanksgiving week only, the market will be held on a Tuesday (November 22) instead of Thursday. This will allow customers to purchase food prior to their Thanksgiving Day cooking and baking. 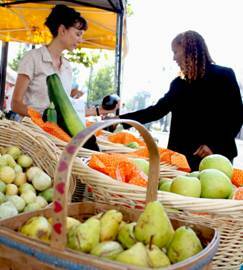 The BLVD Farmers’ Market is held year-round on Thursdays, along The BLVD between Date and Fig Avenues. It includes more than 30 vendors offering a vast array of products. Products offered at the Farmers’ Market include fresh fruits and vegetables as well as a variety of delicious foods including pita bread, hummus and dips; sweet potato pies; gourmet goat cheeses; local honey; dried fruits and nuts; restaurant cuisine and more. The Farmers’ Market also offers other items, such as herbal goat milk soaps and lotions, Rastafarian and African products, sea glass jewelry, and accessories. For more information regarding The BLVD Farmers’ Market, please visit call (661) 723-6077.